The Black + Decker CS1518 electric chainsaw review showcases the product’s features that make it a reliable tool for both professional and DIY users. It comes with a powerful motor, which enables it to handle even the most demanding cuts. The chainsaw provides optimal performance without compromising safety thanks to its 18-inch Oregon low-kickback bar and chain. The product allows you to adjust it quickly and easily without tools. It also boasts an automatic oiling system designed to provide constant chain and bar lubrication. You can monitor oil levels through a clear window on the reservoir. The chain’s automatic oiling system helps extend the tool’s working life. Thus, protect your investment and provide value for money. On the other hand, the brake feature ensures safety during operation. So What’s so great about this electric chainsaw? This Black & Decker product comes with a two-year limited warranty to ensure peace of mind. The brand enjoys a solid reputation. It is renowned for innovative engineering and exceptional workmanship. Buying this chainsaw is a sure-fire way to take advantage of the brand’s years of experience. The CS1518 is quieter and more efficient electric chainsaw. It is a great option when compared to gas-powered variants. In addition, the product is well-balanced and lightweight allowing you to comfortably use it in a wide variety of applications, including landscaping. You can easily cut tree branches while standing on elevated platforms. It makes it easy to stay working for longer than heavier chainsaws. This 15-amp corded chainsaw weighs only 12 pounds. This limits fatigue on shoulders and arms. It has a wrap around guard designed for added comfort for your hands. The feature is designed to prevent injuries when working. Work area limited by length of cord. 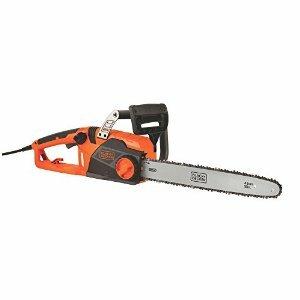 Q: Which oil does the Black + Decker CS1518 electric chainsaw use? A: Any bar and chain oil can be used on this tool. Q: Can I use the orange extension cord, the heavy duty or special extension cord? Q: Can this 15-amp corded chainsaw cut hardwood like oak or mesquite? Q: What size of file should I use to sharpen the chain? A: It is better to buy a new chain. It’s very affordable. Q: Is the CS1518 fitted with plastic gears or metal? Is this the best Electric chainsaw? It comes as no surprise that the Black + Decker CS1518 is a top rated electric chainsaw. It is well suited to many applications and offers multiple safety features. It was designed in a way that makes it easy for professionals and DIY users to handle under varying conditions. The tool produces less vibrations and noise for a more enjoyable cutting experience.